The Jill table features a beautiful, central flower motif which enhances the whole table and adds a romantic finish to the bistro table. Perfect for patio spaces, smaller gardens and even balconies the Jill table is universally loved. Enjoy many romantic meals and sunny breakfasts on the Jill table. 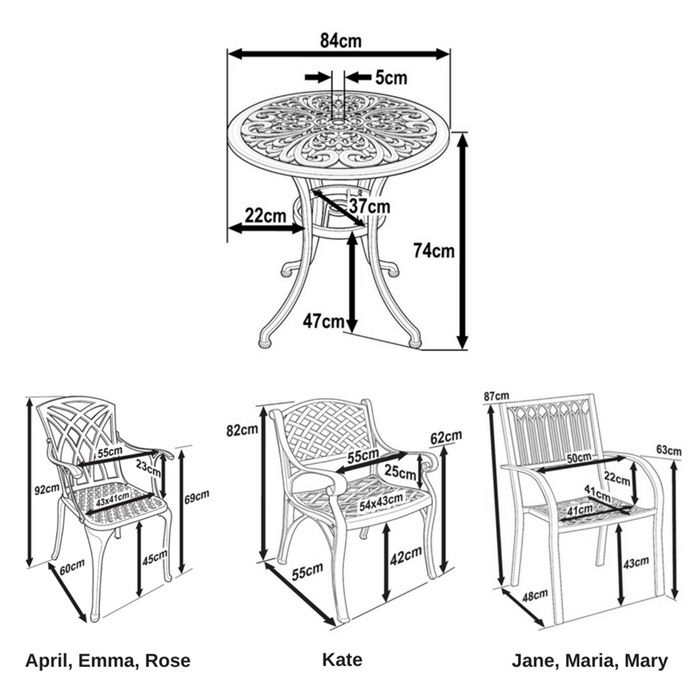 The Jill table also comes with a choice of chairs so you can make it your own. 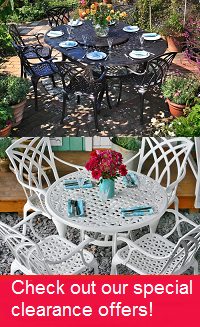 Our Jill table & 4 chair set in White will turn any garden into an idyllic outdoor seating and dining area, perfect for entertaining guests. For a time-worn effect that remains strong throughout the ages, pop on over to the Jill in Antique Bronze, its charming sister in Slate Grey, or in summery Sandstone. Don't forget to look at our gifts section above where we offer amazing discounts of 30-70% on a wide range of products to complement your purchase of the Jill table set. We are over the moon with it, thank you. Unfortunately, we have sold through the entirety of our stock of the April chair in White. Not to worry though, more stock is on the way so pre-order today for immediate delivery as soon as we receive our next shipment around 08/06/2019. Very happy with my purchase. Good quality furniture. Arrived very promptly and was well packaged. The Jill table and chairs took a week to arrive but it is well worth the wait. We are over the moon with it, thank you. Will send a photo when the weather improves. I was very happy with the speed of the delivery,following the order, information re time of delivery, and ease of assembly of the set. Yes I would recommend Lazy Susan to anyone. Not the poor delivery guy's fault that he had to double park, and hold up the traffic, but he managed very well!